Cozy Waterfront Home With Heated Pool…. This 2/2 modern mobile home has a lovely heated pool, screened lanai and a dock to keep your boat. It is fully equipped for your relaxing vacation stay. Open floor plan of kitchen, dining and living room. A visually stunning ride out to the open water takes about 10 minutes at idle speed. All close by, see the Sanibel bridge and views of Punta Rassa and the beginning of Ft. Myers Beach. Located in a quiet nice neighborhood. Why This Property? 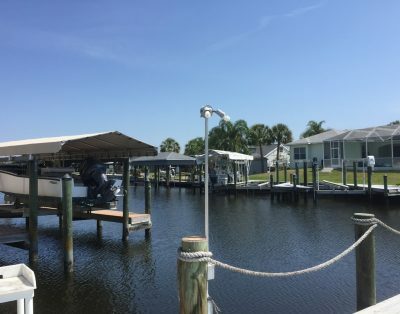 : Close Gulf Access, Heated Pool, Nice Home, Quiet Neighborhood, Boat Lift Available. Diane B. said...Mar 31, 2018...Very comfortable!...We settled right in and totally enjoyed the manatees in the canal, an osprey that loved sitting near the dock for hours! We even had the Easter bunny under the patio! Carl, the manager, was very helpful and quick to respond to questions about the area. The house is very well furnished with everything you need. Just bring clothes and food! The backyard is fenced which worked out well for our dog. Dock is plenty ample if you have a boat or rent one. I totally recommend this property if you like peace and quiet. Only traffic were a few boats! We will definitely come back! Sue G. said...Mar 13, 2018...House was nice. Weather didn't cooperate for using the pool, but it was great watching the manatees and birds in the canal. The accommodations were great. WiFi was very spotty so be prepared to use your data.